Topics: Environmental Systems, Hydraulic Systems, Starters & Charging, Vacuum Systems, Turbo Systems, and Fuel Systems. ns2.webseven.ca, and ns1.webseven.ca are its DNS Nameservers. It is hosted by Hosted Solutions Acquisition Llc (North Carolina, Raleigh,) using Apache/1 web server. 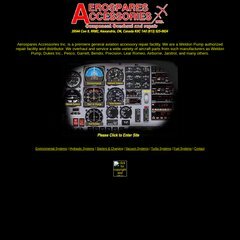 Aerosparesacc.com's server IP number is 207.154.22.71. PING www. (207.154.22.71) 56(84) bytes of data.